134 South Bayley Hazen Rd. Woodturning has long been a passion of mine. 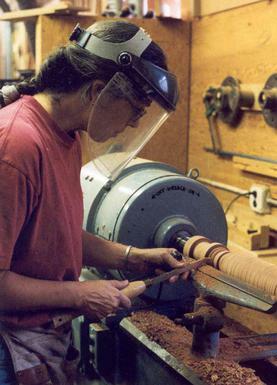 I first learned woodturning as a student in the furniture making program at North Bennet Street School in Boston in the mid 1990's. My woodworking career since has focused on custom furniture making and teaching furniture making and woodturning. Currently, I teach woodworking full-time at the Student Woodshop at Dartmouth College in Hanover, NH. These days, I do more woodturning than custom furniture making, something I feel is a natural progression in my work as an artisan. My studio/shop is located in the barn at my home in Ryegate, VT. I am the third woodworker/woodturner to own the home and work in the shop. 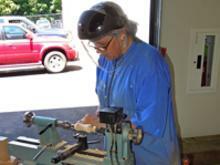 Member of American Association of Woodturners, Twin State Woodturners, Northern Vermont Woodturners and Granite State Woodturners. Twin State Woodturning meeting. Photo by Joe Marshall.